There was no immediate claim of responsibility for today’s suicide bombings. 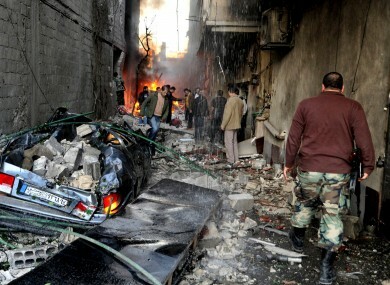 A Syrian soldier, right, and citizens gather at an alley that was destroyed by two cars bombs, at Jaramana neighborhood, in the suburb of Damascus. TWIN SUICIDE CAR bombs ripped through a Damascus suburb minutes apart today, killing at least 34 people, state media said, and rebels claimed they shot down a Syrian air force fighter jet. The state news agency, SANA, said suicide bombers detonated two cars packed with explosives early in the morning in the eastern suburb of Jaramana, a Christian and Druse area known as mostly loyal to President Bashar Assad. Suicide bombings have struck regime targets in Damascus and elsewhere since last December. Such attacks are a trademark of radical Muslim groups fighting alongside other rebels units, raising concerns of growing influence of Islamic extremists among the forces seeking to topple the regime. Today’s bombs were detonated in a parking lot near a cluster of commercial buildings as groups of laborers and employees were arriving for work, killing 34 and injuring 83 people, SANA said. The blasts shattered windows, littering the street with glass and debris. Human remains were scattered on the pavement in pools of blood. Six commercial buildings were damaged in the attacks, and dozens of cars were destroyed, SANA said. After the first explosion, people rushed to help the injured, and then the second bomb went off, said Ismail Zlaiaa, 54, who lives in the neighborhood. Ibtissam Nseir, a 45-year-old teacher, said the bombs exploded minutes before she set off for work. She said there were no troops around the district and wondered why the attackers would target it. Nseir blamed rebels. “Is this the freedom which they want? Syria is a secure country and it will remain so,” she said. There were conflicting reports about the death toll. Two hospital officials, speaking on condition of anonymity because they were not authorized to talk to reporters, said at least 30 bodies were brought to two hospitals. The Britain-based Observatory for Human Rights, which relies on reports from the ground, said 29 people were killed. The different tolls could not immediately be reconciled. The regime restricts independent media coverage. There was no immediate claim of responsibility for today’s bombings. Opposition fighters are predominantly members of the Sunni Muslim majority. In their push to take Damascus, they have frequently targeted state institutions and troops. They have also often hit districts around the capital with the country’s minority communities, perceived to be allied with Assad’s Alawite sect, an offshoot of Shiite Islam. Downtown Damascus — the seat of Assad’s power — has been the scene of scores of car bombs and mortar attacks targeting state security institutions and troops, areas with homes of wealthy Syrians, army officers, security officials and other members of the regime. In May, two suicide car bombers blew themselves up outside a military intelligence building in Damascus, killing at least 55 people. In July, a bomb hit a building in which Cabinet ministers and senior security officials were meeting, killing the defense minister and his deputy, who was Assad’s brother-in-law. A former defense minister also died in the attack. Fighting between rebels and government troops raged on in several parts of the country today. Regime warplanes struck rebel-held areas in the northern Idlib province and Damascus suburbs. In northern Syria, a rebel group claimed it brought down a Syrian MiG-23 fighter plane near the rebel-held town of Daret Azzeh, according to a report by Turkey’s state-run Anadolu news agency. The report quoted unnamed rebels in the area and said the jet was shot down today, most likely by a missile. There was no immediate independent confirmation. Opposition fighters claim they have shot down helicopters and warplanes in the past, although the rebels repeatedly complain their arsenal is no match for the regime’s fighter jets and attack helicopters. In recent weeks rebels have captured several air bases with anti-aircraft weapons, but it is not known if they have the ability to operate them. Since the summer, the Syrian military has significantly increased its use of air power in efforts to roll back the rebels’ territorial gains, particularly in the northeast, along the border with Turkey. Syria’s conflict started 20 months ago as an uprising against Assad, whose family has ruled the country for four decades. It quickly morphed into a civil war, with rebels taking up arms to fight back against a bloody crackdown by the government. According to activists, at least 40,000 people have been killed since March 2011. Assad blames the revolt on a conspiracy to destroy Syria, saying the uprising is being driven by foreign “terrorists” – a term the authorities use for the rebels – and not Syrians seeking change. Analysts say most of those fighting Assad’s regime are ordinary Syrians and soldiers who have defected. But increasingly, fighters adhering to an extremist Islamist ideology are turning up on the front lines. The rebels try to play down the Islamists’ influence for fear of alienating Western support. Email “Car bombs rip through Damascus killing 34”. Feedback on “Car bombs rip through Damascus killing 34”.